All bookings in which your customers have reached at least the ‘checkout’ stage can be found via the menu bar at the top of the screen by clicking on the Bookings tab. 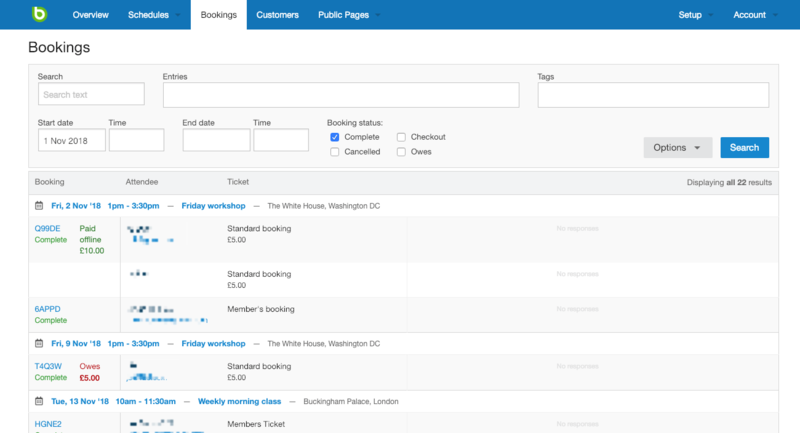 Search text - this will search across all attendee and booking form data, e.g. name, email, address, phone number. Entries - to search within a specific entry. Tags - to search via tags you have attached when creating an entry. Start date/time - The start date/time of the period the portal will search for the booking (this will defaults to today’s date, so be sure to adjust if you are looking for an event in the past). End date/time - The end date/time of the period the portal will search for the booking. Please note that these fields refer to the date of the event, not the booking date. By default this page shows completed bookings only. You can tick/untick boxes for the other booking statuses too. More on booking statuses here. Owes - This checkbox limits your search to those who do not yet have a payment recorded for their booking, or bookings that may be due a refund. Export attendances - produce a .csv file (which can be opened with Microsoft Excel, Google Sheets, or similar) which contains all attendances that occurred, according to your selected search criteria. Export bookings - produce a .csv file which contains all bookings that occurred, according to your selected search criteria.